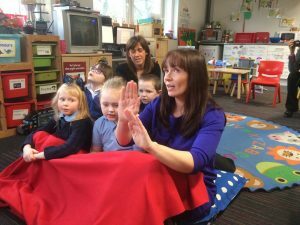 Story Massage has had a really positive impact on the pupils and staff at Thorntree Primary School in Glasgow. Indeed, Thorntree is now a Centre of Excellence in Story Massage. And Depute Head Teacher, Justine Horn and Nurture Co-ordinator, Jennifer Monteith have both won our Story Massage Best Practice Award. And here are five remarkable reasons why we are so delighted to present these special awards for using Story Massage across the whole school. This photo, below, was taken in the nurture group. One of the pupils offered a Story Massage to a boy who was finding it tricky to join in the group. She recognised that it might help him to settle and it did! The anti-bullying squad of Friend Fixers offer support to those pupils who find certain times difficult in the school day, especially during lunchtime play. The Friend Fixers have set up a special Story Massage area in the playground where children can have a massage and relax away from the playground. 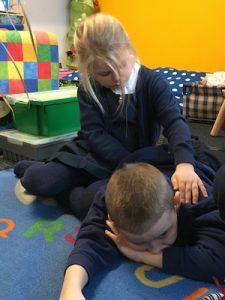 They have written their own massage story to help make children feel safe and know that Friend Fixers will listen to them. There is a weekly Story Massage Club at Thorntree Primary where children can share Story Massage with each other. They share stories from the book Once upon a touch…story massage for children. They enjoy creating their own massage stories using the Story Massage stickers and template. Below, is a short video of children from the Story Massage Club with a story they wrote about Sports Day. The flexibility of Story Massage means that stories can be personalised for an individual child or group of children. 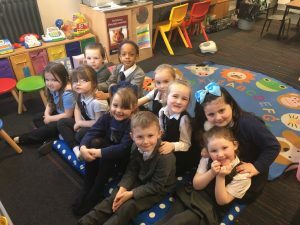 Jennifer Monteith has worked with pupils in the nurture room to write massage stories to deal with problems such as family bereavement, divorce in the family or the loss of a pet. 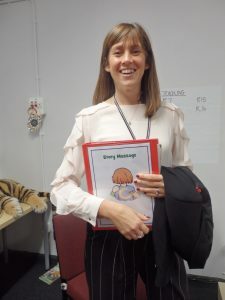 “Story Massage is a really good way of working with children to help them express their feelings in a safe and nurturing way and put those difficult emotions into words,” says Jennifer. Story Massage combines the benefits of positive, respectful touch with the creativity and engagement of storytelling. Ten simple massage strokes form the basis of the Story Massage programme. These strokes have a child friendly name, such as The Circle or The Sprinkle, and an easy to recognise symbol making it accessible for all. It is a fully inclusive activity, no clothing is removed and no oil is used. Stories can be taken from our Story Massage book, adapted from favourite stories, or you can learn to help children create their own stories. 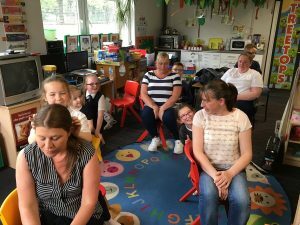 Are you inspired by the way that Jennifer Monteith has used Story Massage in nurture groups and across the whole school? Would you like to train to use Story Massage in your work or home? 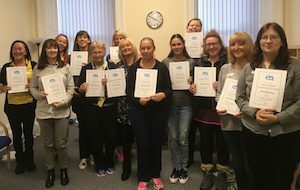 We run one day accredited training courses that is held around the country for individuals and groups. These days can also be organised as in-house training sessions. We teach you how to share the ten Story Massage strokes and work with you to adapt familiar stories and even create some sensory stories of your own. Ideal for teachers, SEN staff, support staff, therapists, Early Years practitioners, Baby Massage Instructors, Relax Kids Coaches… everyone with an interest in sharing positive touch activities for the health and well-being of children.